Snow even now continued to fall on windows in Lunéville. In an inn’s room, a man crossed his arms and knit his brows in thought. His goal was to draw in and stand out in various ways, he had even been able to acquire various evidence. However, all of the information were just minor things. None of the information was something that could become solid evidence, it was as if the closer her approached, the more it became like catching a cloud with his bare hands. As for what the man desired, it was nothing but a solid fact. For his entire life, if someone was innocent, that person must have some trace of corruption as well. If there was a person whose behavior could only be thought of as pure white, they must actually be pitch-black. It would be easy if those people showed their true colors, but since they don’t, it could be said that’s the reason why this man was sent. His unintentional sigh didn’t fog the air, so he felt thankful towards the room’s warmth as he recalled the prolonged cold outside. In contrast, there were two young human and beastkin boys outside the window, chased after by a young beastkin girl while breathing out white breaths. Furthermore, a young human girl was running after the three people. Seeing the scenery and events happen one after another, the man unknowingly smiled. The man recalled his decision and reaffirmed himself, striking the whip to his mind that had started to lose strength. He stood up and stretched his hand out to his jacket. A few days later. When snow that had been piling up was being removed at a faster rate than it fell, the dissatisfaction that was accumulating in the branch had finally reached the point of eruption. Considering his background, she didn’t take it as a joke. Likely still afraid of Ilya, Bard fell silent as though he were sulking. To make up for that, a voice came from across the counter. Hearing that voice coming from a counter seat, people in the dining hall spoke their agreement and approval. They didn’t have that much persuasive power even if they said that; they were regular customers that spent all their time here beforehand since beforehand. Their galantness from during the ice dragon subjugation was nowhere to be seen, as though it were blown away by its breath. Even so, it was only in the beginning that they were able to be in high spirits with the unfamiliar snow. The gradual build up of stress due to it limiting their actions was real. As she was thinking absentmindedly, men wearing two to three layers of clothing to act as protection against the cold could be seen entering the branch. Although most of them drew close to the fire stone heater to warm themselves, Darren, a beastkin that was part of the branch’s staff, headed towards Ilya. Setting aside the more recently built buildings that were sturdy, the older ones’ roofs were aged and deteriorated, so the danger of collapsing from the snow’s weight was high. Even though there was a pressing need to remove the snowfall, they couldn’t very well excessively waste their insufficient fire elements even at the best of times, and even magic wasn’t so versatile as to be fine-tuned enough for that. Therefore, guards had their hands full with plowing snow from the street and the lord couldn’t stand the situation any longer, so he sent out a commission for snow plowing to the guild. With a few memories connected to that word, Ilya greeted Darren, who was prudently shedding snow from himself. The answer that came back to her was that nothing had been particularly done with it, but that was a convenient answer for her. Finished with the procedure of completing the commission, Ilya went to Hector during her break. Ilya headed down the street wearing a pea coat so as to not seem out of place in the town. Although the snow plowing was completed, people who weren’t accustomed to the snow still weren’t able to walk too easily due to the ankle-high snow cover. Holding Haku and heading to the lord’s mansion while paying attention to how much snow there was, she managed to make it there without being found by the branch vice manager. This wasn’t a coincidence of course, it was due to her using skills like [Presence Inference]. Accepted inside without any problems in particular despite it being such a sudden visit, she met Hector in the parlor. Recently they’d only been able to talk through documents, so the topic naturally flowed towards that. When she cut straight to the point and showed him a certain opportunity because she couldn’t stay too long, Hector gave a puzzled look. However, a paradoxical supplement came from her mouth. However, although Hector admitted it, he immediately shook his head in denial. After though, although the two talked a little more, Hector would not withdraw his financial backing. This was Hector’s obstinacy that Frank had spoken of. Realizing just how correct those words were, Ilya could do nothing but smile wryly. Drawing up the commission chart that same day, she stuck it to the bulletin board. Several people who saw it weren’t able to believe it, letting out perplexed voices. The crowds reacted as though they were caught on a hook. Hearing the question that everyone nearby was thinking, they also looked towards her. Finally receiving that question, Ilya smiled and answered. The entry requirements were fully opened, men and women of all ages in Lunéville could join, regardless of guild. They could register in groups of ten or less and would be assigned an area to manufacture their monument at. There were no limits on what could be depicted, with sabotage coming with a fine. Rules such as coming and going between between branches would be set in the future. The three top participants would be given a prize. Scenes of an event from another world passed through her mind. Although people looks a little confused when she first said what it was, people put their name into it as soon as they understood. The following day saw the reception area packed full of people, turning into a situation where the reception area would temporarily be moved to the second floor’s private room. However, even though it should have become peaceful after that, it was troublesome having to explain to the occasional people arrived late and inquired about it. But there was also trouble on the service side as well. In the parlor on the third floor, Ilya was being subjected to the branch vice manager’s questioning. His eyebrows were knit together to the point that one would wonder if they weren’t connected. With his temple twitching, it was obvious that his level of resentment wasn’t normal. The branch vice manager struck the window frame. Beyond that window, citizens were frantic… but it was as though they were enjoying themselves. They were building snow figures. While thinking that his rejection was a little surprising, Ilya spoke the words she had prepared beforehand. She hadn’t intended to purposely increase the number of troublesome things, but it would have been unfortunate if she hadn’t thought that something to this degree would happen. Anything she said would have likely been wasted. Judging that, Ilya decided to drive the situation to her concession. However, if he still wasn’t pleased with that, he should be satisfied with the statement of taking responsibility. Even if his true intention was about something from beforehand, since it had already begun and was under Hector’s name, Ilya felt that the branch vice manager could not help but to accept the proposal. However, it looked as though he really didn’t want to accept what she said. He groaned, seeming as though he wouldn’t withdraw. It was at the time she thought something like that. It was a boy with horns coming from under his long red hair. There was a small person with butterfly-like wings sprouting from her back on his shoulder… a fairy. Unable to stop the two, Cynthia looked at Ilya on the verge of tears. For now, Ilya took over by nodding towards her. Not paying attention to Cynthia who had cheerfully withdrawn with a bow, the boy and fairy walked into the parlor. The moment that the fairy looked between Ilya and the branch vice manger, she sighed as though losing interested and turned back to Ilya. And, still standing on the boy’s shoulder, spoke with her finger pointed out. Not even realizing Ilya was unable to properly respond to her, she continued with a boastful coo. The horned youth and the fairy were Ilya’s friends. The fairy’s name was Partia. She had so much power that were it not for the curse, she would become a fairiel, a superior species of fairy. Of course, since she was also fraught with worry about the possibility of it spontaneously discharging and going out of control if she didn’t become that superior species, it could be inferred that she held an abnormal power. There was another person of note. Gabriel was part of the demon god’s family, which was one of the pillars of three gods that matched the dragon god. Before he could finish his sentence, a silvery white sword thrust up from the floor, stopping just before his neck. Unable to move, a small boy the size of a stuffed animal appeared in front of him, having slowly appeared from the floor along with the sword. He was different from Partia in that he had no wings, but instead had a folded pointy hat on with a long beard. The child’s voice didn’t make it to the branch vice manager, it only reached his ears as natural vibrations in the air. On the other hand, Ilya, who had properly heard his statement and didn’t change her expression, was shouting in relief in her mind. He was a person who didn’t have the aptitude to hear the voice, proving fortunate right now. Having finished making his threat, he couldn’t not continue. Ilya shook her head to Gabriel, indirectly saying that it was unnecessary. While speaking in embarrassment, the sword disappeared along with the small person as though melting into the floor. A great spirit, the highest ranked earth spirit. Although his personality was usually open-minded, Ilya and gems were the two things he would never bend on. With him obediently returning, Ilya placed her hand on her chest in relief that it didn’t become the worst case scenario. Being the lord of this great spirit was just another thing that made Gabriel worthy of special mention. Along with being a demonically strong swordsman by removing the limits on his body’s physical abilities through his demon elements, Gabriel was also a contractor of a great spirit that could freely manipulate earth elements. In addition, he always acted lackadaisically, innocently waiving his hand with loosened cheeks to Ilya when they met gazes. If the contractor weren’t the owner of a personality like that, one or two countries might have already been ruined. Securing these two’s cooperation, it was easy to imagine that they could forcibly subjugate the ice dragon even without a plan. However, that would be if they actually had a chance to use their power. Being told that in an apologetic manner, Partia’s face froze. Contrasting the frozen girl, Gabriel showed a carefree smile. Attacking her companion, the cute fairy pulled Gabriel’s cheeks with a face that seemed like she wanted to cry. 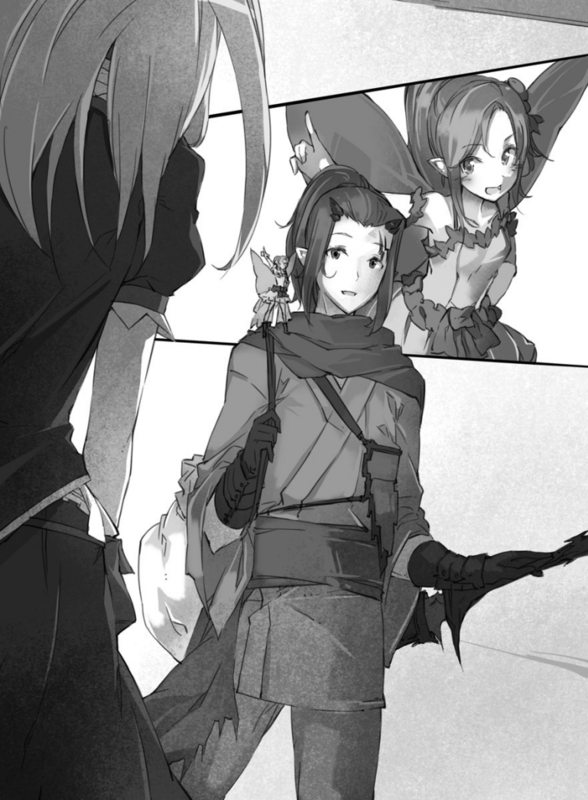 Partia blushed due to Gabriel’s smile, filling the room’s air in swee~tness. When she looked at the fairy and youth, which seemed as though their intimacy hadn’t changed, with a wry smile, she noticed the two had stopped talking. Contrasting Gabriel’s always calm expression, Partia’s face reddened like a mini tomato, only able to open an close. It would take a while for Partia to recover. Concluding that on past experience, Ilya decided to speak to Gabriel. Obtaining his agreement, Ilya finished up business with them faster than otherwise and turned back towards the branch vice manager. He spat out the words as though it strained him. It was as though he feared something of a character he didn’t know, he wore a stiff expression. If someone who only knew of her reputation before they had come to Lunéville was related to an organization or someone else that was hostile towards her, then they would most likely think that she was plotting something. Even though she tried remembering him, she hadn’t seen the branch vice manager’s face outside of Lunéville. So Ilya decided to be businesslike. Although the branch vice manager showed strong bewilderment, Ilya continued speaking without going back. Purposely speaking as though guessing, she didn’t forget to emphasize that the event was proposed by Lord-sama. From the branch vice manager’s expression, it was obvious that it wasn’t the answer he expected. However, he hadn’t intended to debate from the start. No response. He could neither rebut nor correct her. At this point, there was nothing left to discuss. When she bowed and headed to the door, Gabriel and Partia naturally looked towards her. Nodding with a serious face before going back to smiling, Gabriel also turned towards the door and left through it. However, Partia turned around, facing the branch vice manager. Not thinking that he would be addressed, he was surprised. Partia, gazing at him with a perfectly innocent smile—spoke. Satisfied at just that, Partia moved from Gabriel’s shoulder to Ilya’s. And whispered that into her ear. That shocking sentence was wholly unexpected, but it was vexing that she couldn’t deny it.